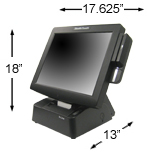 The S-Line stands 18" tall and 17.6" wide, and will free up the space beside your POS terminal by eliminating the need of an external printer. You can now use this space to generate additional revenue by displaying advertisements or selling merchandise. The S-Line has a bright 17" display, and is powered by Intel's Atom, up to 4th Generation (Haswell) Core i7 processor. 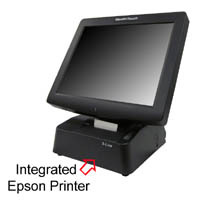 It runs most Windows operating systems, and offers a wide range of integrated peripherals, such as magnetic stripe reader, biometric reader, barcode scanner, and secondary display. Expandability includes Intel Gigabit network, 4 Serials, 6 USB, poweredUSB +12V and +24V. Standard features: Intel Gigabit network, 4 Serials, 6 USB, poweredUSB(12V, ext.VGA.